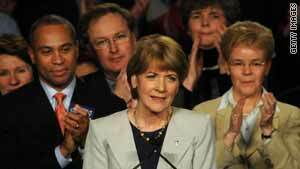 Democratic candidate Martha Coakley gives her concession speech Tuesday night. Boston, Massachusetts (CNN) -- Even before the polls closed on Tuesday night, Democrats were distancing themselves from their candidate, Martha Coakley, and blaming her stunning loss in the U.S. Senate race in Massachusetts on what they described as a lackluster campaign. A top adviser to President Obama rejected assertions that Tuesday's vote was a referendum on the president or Democratic policies, and instead took a shot at Coakley: "Campaigns and candidates matter." For weeks, Coakley's Republican opponent, Scott Brown, had been the underdog candidate, running behind in the race to finish out the late Sen. Ted Kennedy's term. Trailing by double digits a little more than a week ago, Brown edged ahead of Coakley, campaigning as the pickup-truck-driving candidate, capitalizing on voter frustrations, and vowing to send Obama's health care bill "back to its drawing board." Coakley, the state's attorney general, had been considered a shoo-in in heavily Democratic Massachusetts, which hadn't elected a Republican to the Senate in 38 years. But as Brown gained momentum and Coakley's numbers fell, Democrats rushed in the big guns to campaign for her, including Obama and former President Clinton. How does Brown's win change things? In the hours after Coakley's concession speech, though, Coakley's pollster Celinda Lake fired back at criticism that Coakley ran a weak and misguided campaign and failed to recognize Brown's surge until it was too late. Instead, Lake warned Democrats, "There's a wave here. The first shore was New Jersey and Virginia," she said, referring to Democratic losses in the governors' races there, "the second was Massachusetts, ... so we'd better do something about it." Other Democrats appeared to interpret the recent votes as representing anti-Washington sentiment. Sen. Jim Webb of Virginia said that the Massachusetts election "became a referendum not only on health care reform but also on the openness and integrity of our government process." Video: Scott Brown for president? Video: Did Independents sink Coakley? While Democrats huddled to try to figure out a way to get their health care bill passed before Brown is seated and ends their 60-seat filibuster-proof "supermajority" in the Senate, Webb said it would be "prudent" for Congress to suspend further votes on health care reform legislation until Brown is seated. Rep. Anthony Weiner, D-New York, said Tuesday night that the Massachusetts results demonstrated Democrats have to change their strategy on health care. "Large numbers of independent voters saying they're upset about health care, that's not just their fault, that's our fault too. And we have to think about what we're doing wrong here. And to have a conversation as if nothing happened, whether you're in Massachusetts or not, is being tone deaf." Sen. John McCain, R-Arizona, said Tuesday's election was a wake-up call. "Last night, a shot was fired around this nation ... saying no more business as usual in Washington, D.C.," he said on the Senate floor Wednesday. "Stop this unsavory sausage-making process called health care reform, where special favors are dispensed to special people for special reasons in order to purchase votes." Brown warned in his victory speech that Democrats will face the same factors in the midterm elections in November that led to his win in Massachusetts on Tuesday. "We had the machine scared and scrambling, and for them it is just the beginning of an election year filled with surprises." he said. "They will be challenged again and again across this country. When there's trouble in Massachusetts, there's trouble everywhere -- and now they know it." Heading into the race, few political analysts believed Brown, a state senator, had a serious shot at beating Coakley. Brown was underfunded and unknown statewide. No Republican had won a U.S. Senate race in Massachusetts since 1972. Democrats control the state's congressional delegation. They also hold the state's governorship, along with overwhelming majorities in both houses of the state legislature. But Brown, who is in his third term in the state Senate, charged forward on a pledge to end wasteful government spending and hand politics back to the people. Before he was in the state Senate, Brown served three terms as a state representative. He's also a member of the Massachusetts National Guard. "He's branded himself brilliantly. He has run as the people's senator," said Jennifer Donahue, a political analyst and contributor to The Huffington Post. Asked in a debate last week if he was willing to sit in Kennedy's seat and block health care reform, Brown replied, "With all due respect, it's not the Kennedys' seat, and it's not the Democrats' seat, it's the people's seat." Donahue said that was the game changer for Brown, because Coakley "didn't have an effective answer against that." More than perceptions of the candidates' strength and weaknesses, it's discontent among voters in Massachusetts that swung the election, said David Gergen, a political analyst and CNN contributor. "Scott Brown turned this into a referendum on what's going on in Washington, especially with health care. His campaign began to gain traction when he said that, 'I am going to be the 41st senator, the one who can stop a lot of this,' " Gergen said. Gergen also pointed to a major sports gaffe that might have hurt Coakley's image in Red Sox nation. In a recent radio interview, she suggested that former Red Sox pitcher Curt Schilling is a Yankees fan. "When she was clueless the other day about who Curt Schilling was ... you can imagine what that did," Gergen said. John Avlon, author of "Independent Nation: How Centrists Can Change American Politics," says in the end, the results of Tuesday's election rested in the hands of independent voters. Democrats far outnumber Republicans in Massachusetts, but there are more independents than Republicans and Democrats combined. "Independents asserting their real power, even in Massachusetts, should be a huge wake-up call to Democrats and Republicans." Regardless of the outcome, Avlon said, this shouldn't be viewed as voters turning on Obama. "Independents like the checks and balances of divided government. They dislike the ideological arrogance and legislative overreach that comes when one party controls both the White House and Congress. That's what you're seeing," he said. CNN's Ed Henry, Jessica Yellin, Paul Steinhauser and John Helton contributed to this report.